Design Bindery LLC, has set out to create a new, no-nonsense way to buy personalized notebooks and writing journals- whether direct to consumer, via wholesale or private labeling to corporate/promotional accounts. We favor a business model of collaboration over competition. As the print, publishing and book manufacturing industries continue to morph and evolve, you can either toss in the towel or look closely at what is really driving the change. (Look no further perhaps than the increasing pressure of Amazon). To survive and thrive moving forward, we feel our peers in the industry must cooperate for the betterment of all their clients: the print buyers, the clients, and book buyers from all walks of life. Companies who feel they are “competing against” each other need to realize that the real battle is not among themselves but in growing the number of people interested in the tangible: paper, print and in particular, the printed book. Our motto for the times is: Let’s not focus on how to make things cheaper. Let’s focus on how to make things better! Sounds like a lofty goal, but this is what we are striving for. A little bit about our For Good Mission for 2018! Since we began, we have always dedicated a portion of our time and talents towards doing good by helping others in need both in our local community of Lincoln NE and around the world. 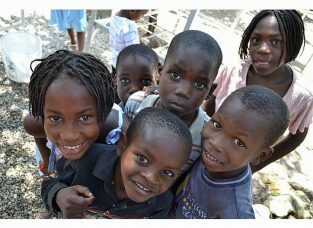 Later this spring we will unfold some news about a mission related program we are going to be working on in conjunction with a 501 C organization in Haiti. We’ll be training artisans there bookbinding skills to help them establish their own style and lines of books and journals to sell through island gift shops and also for wholesale importing to stores throughout the US. The proceeds from the sale of these products will be used for supporting an orphanage in Haiti. We feel this is a worthy cause and we’re going to get involved! Stay tuned, I do hope you keep coming back so that you can join our community for this cause.